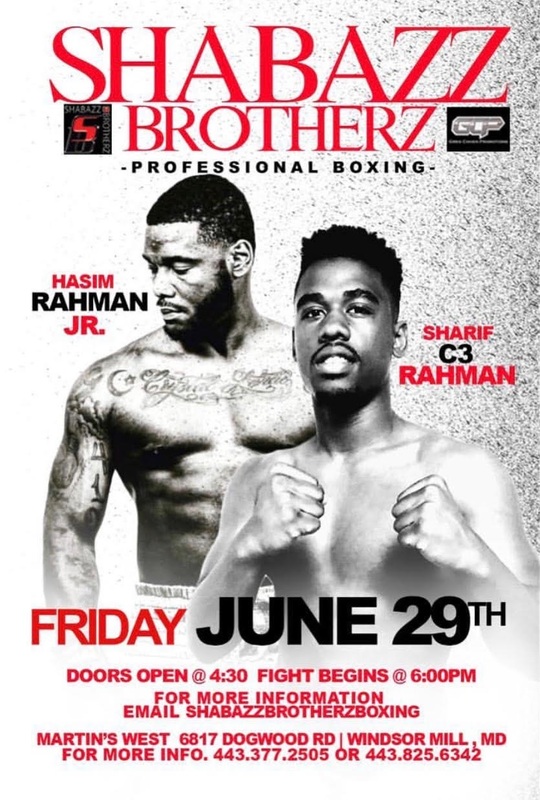 For the first time since 2015 Shabazz Brotherz Boxing is returning to Martin's West with an incredible boxing card that features the sons of Hasim Rahman and his younger brother. Hasim Rahman is the former Lineal, WBC, IBO, and IBF Heavyweight Champion and is son Hasim "Gold Blooded" Rahman Jr. (4-0) is on track to follow in his footsteps. As a heavyweight contender, Rahman Jr. made his professional debut in April of 2017. Sharif "C3" Rahman (2-0) the younger son of Hasim Rahman will be returning to the ring after a TKO win in September of 2017. Sharif made his professional debut as a cruiserweight in November of 2015. Mushin "The Spartan" Cason (1-0), younger brother of Hasim Rahman, made his professional debut as a cruiserweight last month. Also returning to the ring is Baltimore native Tyrieshia "Lady Tyga" Douglas (13-1). Douglas is currently the IBA Bantamweight Champion and holds the UBF World Female Super Flyweight, UBF Flyweight and UBF Bantamweight titles. Her opponent is Helen Joseph (15-3-1) from Nigeria. As a special feature bout, Junior Olympics Gold Medalist Lorenzo "Truck" Simpson will step into the ring against Maurice Winslow. Eighteen year old Simpson is the winner of six Ringside Boxing National Silver Gloves Championships and the nephew of Hasim Rahman. Check out this video clip! Among the crowd will be special invited guests to include Public Figures, Professional Athletes, Dignitaries, and a host of dedicated fans. Martin's West is located at 6817 Dogwood Rd., Windsor Mill, MD 21244. Doors open at 4:30 PM and fight begins at 6:00 PM. To purchase tickets call (443) 377-2505 or (443) 825-6342.